HackerProof is a trustmark that is displayed on a website to build trust and confidence. Many studies have shown how a visual indicator that reminds visitors of their security helps improve sales conversion. Behind HackerProof is a powerful daily scanning engine that ensures HackerProof websites meet Comodo's standards. The interactive trustmark provides up to date scanning information to visitors for added assurance. HackerProof is also built with the website owner in mind. Innovative new tools, such as SiteInspector, ensure that the website is on the leading edge of security and one step ahead of hackers. 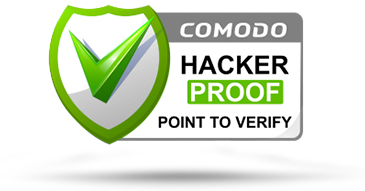 No other trustmark provides the robust features and value of Comodo's HackerProof.